Last night, attendees of Salesforce’s big “Dreamfest” concert––featuring Metallica and Janet Jackson––were greeted by a massive message projected on the side of the venue and nearby buildings calling out Salesforce’s multimillion dollar contract with US Border Patrol and directing viewers to a text-in number where they could take action. Fight for the Future will continue to escalate until the meeting is officially scheduled and these conditions are agreed to. 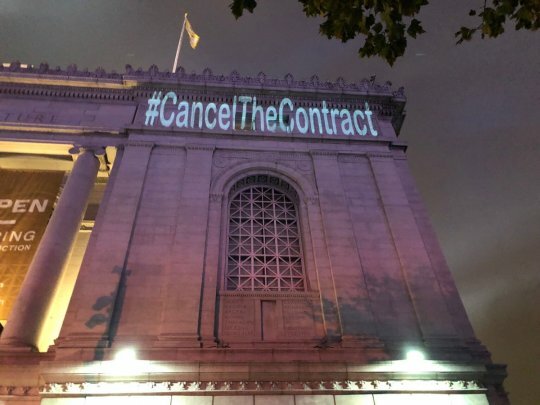 The projections, which clearly got Salesforce’s attention, highlighted the #CancelTheContract hashtag, which has spread during the Dreamforce conference. Another directed viewers to “Text BENIOFF to 384-387 to learn his secret.” Texting the number triggers a response with information about Salesforce’s contract with border patrol and a link to take action. The latest protest comes just one day after Fight for the Future, Mijente, and other groups made a splash at Dreamforce with a 14-foot tall, 800-pound, Salesforce branded cage that represented a Border Patrol detention center. Fight for the Future, a digital rights organization, has been running a campaign at DropSalesforce.com, calling on Salesforce to cut ties and stop supporting human rights violations. During his keynote remarks at Dreamforce on Tuesday, Salesforce co-CEO Marc Benioff warned tech companies against leaving criticism and feedback from customers and consumers unacknowledged. Benioff says, “If trust is not your highest value…your employees and executives are going to walk out.” The statement is feels a bit empty, given that Salesforce is continuing to maintain a multimillion dollar contract with US Border Patrol despite the backlash of customers, partners, immigrant rights groups and employees.